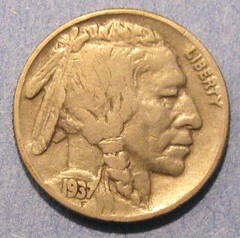 I just recently bought a 1937 reeded nickel, which I believe is an Ira Reed nickel of the 1940's. I ran across an article on the Internet that appeared in your newsletter a while back. I am looking for a picture of an example of a confirmed Ira nickel - does anyone know where I could find one of these? I would like to find out how many reeds are on the nickel, and how thick they might be. I attached pictures for advice, thanks for your time. 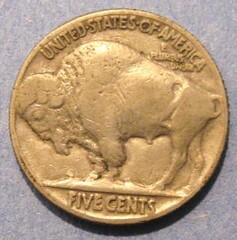 "An example of Reed's reeded nickel is illustrated on page 56 of my book, "The Complete Guide to Buffalo Nickels", Second Edition. 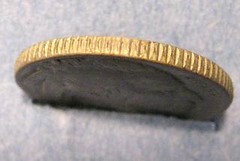 The edge is clearly visible. I've seen a number of these coins, and I've noticed that the reeding is not always the same. A few have much finer reeding than on the example illustrated. This suggests to me that additional pieces have been made to sell as novelties. For that reason, I don't advocate paying a significant premium for any example that isn't traceable back to the 1941 ANA Convention. Even then, its value is based on its memorabilia interest. Such coins have no numismatic value. The piece illustrated in my book is, I believe, one of the 1941 originals and has rather broad reeding. In case anyone didn't get it, Reed had these coins REEDed as a play on his name."